The verdict is out — Salman Khan was on Wednesday sentenced to five years in jail for a 2002 hit-and-run accident. And that leaves a pall of uncertainty over the fate of his film projects worth a whopping Rs.200 crore. But industry experts say there’s no cause to worry. “The High Court has accepted his appeal,” trade expert Vinod Mirani told IANS, adding that the courts have of late become “strict” and “stringent” in judgments over car accident cases. “The media has been doing its own trial for Salman Khan for the past two days, so the court can’t be lenient…,” Mirani said. Over the past few years, trade experts agree, Salman’s films “Dabangg”, “Wanted”, “Ready”, “bodyguard” or “Ek Tha Tiger” have turned out to be box office winners. This year, the actor has been geared up for movies “Bajrangi Bhaijaan” and “Prem Ratan Dhan Payo “, which are nearing completion. Both are much-anticipated projects — Kabir Khan’s “Bajrangi Bhaijaan”, which also stars Kareena Kapoor Khan, is about a Brahmin girl and Muslim boy; while Sooraj Barjatya’s “Prem Ratan Dhan Payo” would see him revisiting his popular cinema name ‘Prem’. “The total cost of the two films would be around Rs.200 crore plus. So that is the amount riding on him at present,” industry expert Amod Mehra told IANS. “Prem Ratan Dhan Payo”, in which he shares screen space with Sonam Kapoor, is a tad more special for him and his fans as it marks Salman’s return to a Barjatya film after 15 years — after the 1999 movie “Hum Saath Saath Hain”. Besides, if rumoured sequels like Anees Bazmee’s “No Entry” and “Kick” are considered, the amount that’s riding on the “Dabangg” hero, will shoot up. The verdict in the high profile case, which left one man dead and four others injured, was announced at a packed courtroom in the presence of Salman and his family members here by Additional Sessions Judge D.W. Deshpande. One of the highest paid actors in Bollywood, Salman was sentenced for culpable homicide not amounting to murder, driving without licence and other charges. He was also held guilty of rash and negligent driving when he was behind the wheel of the Land Cruiser that killed the man in suburban Bandra in September 2002. 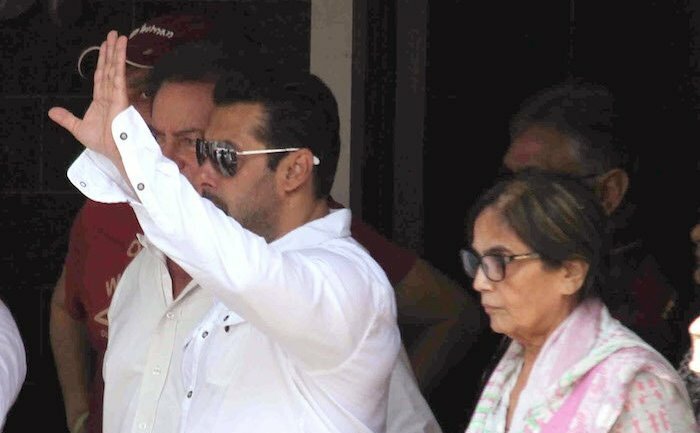 Defence lawyer Shrikant Shivade, who pleaded for a milder sentence keeping in view the social services the actor was involved in and his medical problems, moved the Bombay High Court, which granted Salman an interim bail of two days. The actor, who will turn 50 later this year, is believed to have stopped accepting any new projects till the verdict was pronounced. This is not the only case Salman is facing. The celebrated actor, who has been enthralling the Hindi film audience for over 25 years, is also facing trial for hunting a black buck during the shooting of “Hum Saath Saath Hain” in 1998.